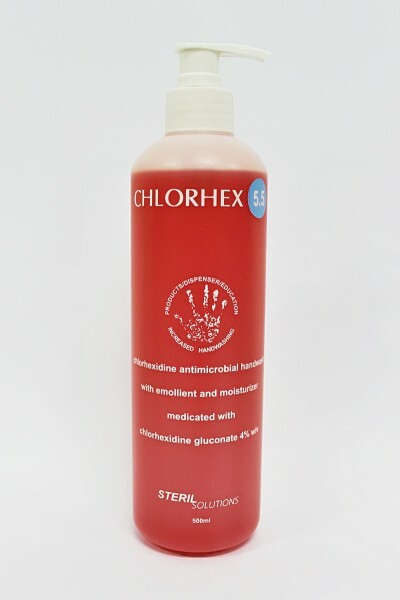 CHLORHEX 2% is an antimicrobial hand wash containing Chlorhexidine gluconate 2%, an active ingredient which is effective against a broad spectrum of Gram-positive and Gram-negative bacteria. Contains emollient to protect the skin from irritation that follows repeated washing. CHLORHEX 2% is supplied in a 500ml bottle and a dispenser that controls wastage by releasing only 1ml of solution with every pump and preventing subsequent spout drip. SKU: HUN 00 00 03. Category: STERIL Solutions.